Let's be honest, every day should be Unicorn Day, but this Tuesday, April 9th, is the actual EXTRA SPECIAL SPARKLY NATIONAL UNICORN DAY!! Publishers, authors, and booksellers all over the country will be celebrating and we'd like YOU to join US! Stop by Books Inc. Campbell on Tuesday for ALL DAY readings of Unicorn-centric stories, an in-store scavenger hunt (Ages 2+), and a special gift to anyone (of all ages) who swings by the store dressed up like a Unicorn! If you'd like continue the celebration into the month, stop by Books Inc. Palo Alto on Thursday, April 25 at 6:30pm and meet Dana Simpson, creator of the Pheobe and Her Unicorn Graphic Novel series! 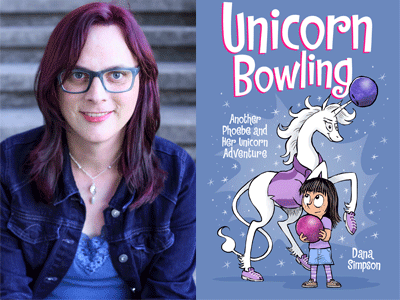 Dana will be celebrating the newest book in the series: Unicorn Bowling! 1. The unicorn is the national animal of Scotland. 2. Unicorn hunters may obtain a Unicorn Questing Licence from Lake Superior University, Michigan. 3. According to Pliny (a Roman author way way back in the day), a unicorn had the body of a horse, the head of a deer, the feet of an elephant, and the tail of a lion, with a black horn projecting ‘two cubits’ from the middle of its forehead. Or you can always stop by your local Books Inc. and grab a copy of any of these wonderfully beautiful and fun Unicorn books.